Guide to Canine and Feline Electrocardiography offers a comprehensive and readable guide to the diagnosis and treatment of abnormal heart rhythms in cats and dogs. The book explains the principles of electrocardiography, from the basics of how to obtain a good quality electrocardiogram to the diagnosis and treatment of the most complex arrhythmias. Numerous case examples, including electrocardiograms and Holter monitor recordings, help the reader understand all the steps needed to achieve a correct diagnosis. The characteristics of both normal and abnormal heart rhythms in dogs and cats are covered in detail, with an emphasis on abnormal heart rhythms that are likely to be significant and require treatment. In addition, the book describes the full range of treatment options currently available, including traditional medical treatment as well as newer interventional treatments. 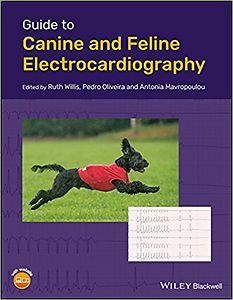 Guide to Canine and Feline Electrocardiography is an indispensable resource for veterinarians in general practice with an interest in cardiology, as well as referring specialists. It is also a welcome reference for veterinary students and those studying for a postgraduate qualification in cardiology or internal medicine.